Standard transition links are mostly too narrow for wire rope slings, meaning that wire rope thimbles don‘t have sufficient space and/or room. Transition link for offshore container lifting purposes in welded chain slings. 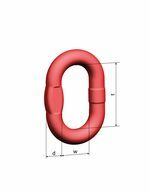 Particularly suited for wire rope slings, due to the inner width to give space for wire rope thimbles. Connection link for individual chain legs and transition link in IV-leg master link assemblies VOS-DNV 2.7-1. Type approved in accordance with DNV 2.7-1. Type approval certificate no. S-8254.